Shane Burger has been appointed the new head coach of Scotland’s national cricket team, succeeding Grant Bradburn who left to take up a coaching role with Pakistan late last year. Burger, who will take the reins from March 2019, joins from South African first-class provincial side KwaZulu-Natal Inland, where he has been in post since 2015. During his time in Pietermaritzburg, Burger led the team to three trophies including the Africa Cup T20 in 2017. He was named CSA coach of the year for the 2015/16 and 2017/18 seasons, and has also worked with South Africa ‘A’. He has experience of UK cricket having spent 12 seasons as an overseas player and Director of Coaching at Hertfordshire’s Radlett Cricket Club, and played 91 first-class and 79 List A matches as an all-rounder for Gauteng, Lions and KwaZulu-Natal Inland in a 14-year professional career in his homeland. Burger said: “I am both delighted and honoured to be awarded this position as head coach of Scotland. “The opportunity to work with players who have already shown that they can compete with the best in the business is an exciting challenge. Cricket Scotland CEO Malcolm Cannon added: “Shane impressed the selection panel not only with his skills and experience but also his passion for the role, his leadership capabilities and people management skills so we very much look forward to welcoming him on board. “The appointment follows an extensive recruitment process and the selection panel was impressed by the number and quality of applicants from seven different countries. “We are looking to build on notable successes against four different full members in the last 18 months, including the historic first ODI win against England last June. 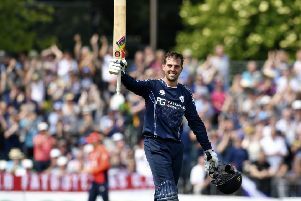 Welcoming the appointment, Scotland captain Kyle Coetzer said: “I spoke with the players yesterday and we are all looking forward to Shane’s appointment.